← Looking for online audiovisual resources? Last year one of our volunteers wrote a post about the impact of the First World War on staff at the London Day Training College (as the Institute was then called). During the war a number of staff signed up, or were conscripted to the war effort and the war memorial records the names of the three members of staff and 37 present or former students who lost their lives during the war. Although training for women, as well as men who had been pronounced medically unfit for military service, continued throughout the war period, the lives of many more were put on hold and male student numbers fell drastically from 113 in 1914 to just 16 in 1916. As the war continued plans were put in place to ensure that when soldiers did finally return at the end of the war support was in place to enable them to readjust back to civilian life. 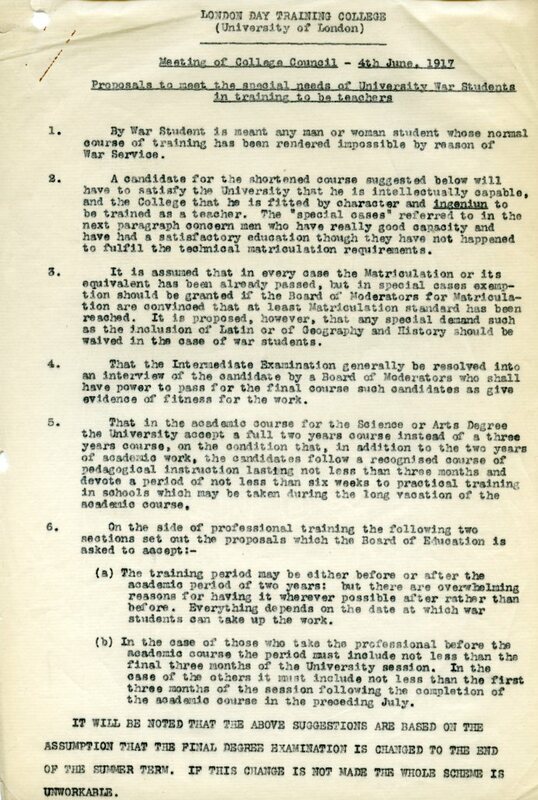 At the meeting of the LDTC’s Council on 4th June 1917 proposals were discussed to meet the ‘special needs’ of university war students in their training to be teachers. The definition of war student was purposefully broad and meant ‘any man or woman student whose normal course of training has been rendered impossible by reason of War Service’. A relaxation of formal qualifications required for courses, shortened courses and a greater flexibility in part and full time courses offered by the LDTC, in addition to extended grants from the Board of Education, helped the post-war student numbers at the College jump from 199 in 1918-1919 to 913 in 1921-1992. In the archives we have background information on the courses, all the Announcement of Awards for those students who studied at the LDTC as ‘Ex-Service Students’ and details of the grants available to students from the Board of Education. Many of the letters from students provide an insight to what life must have been like for men returning from the war. Many write of their lack of any income apart from government grants, meaning that they have returned to their parents’ home to live. 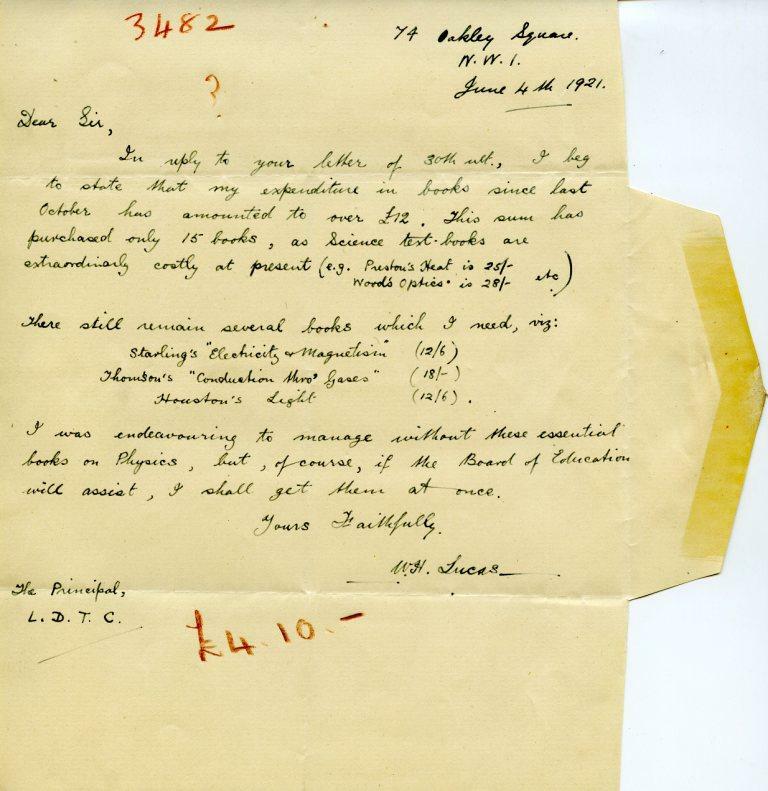 In addition the letters from the parents of ex-soldiers who started courses and sadly died part way through is a reminder of the Spanish flu epidemic that claimed the lives of so many millions in the period 1918-1920. The national scheme for training ‘War Students’ after the First World War was quite small but a similar scheme introduced after the end of the Second World War was much larger in scale. Designed to not only provide employment for returning British Forces personnel and others affected by the war, it also helped meet the demand for teachers required after the passing of the 1944 Education Act. By the time the scheme ended in 1951 some 35 000 teachers had completed the shortened one-year course. This entry was posted in Library and Archives and tagged archives, First World War, London Day Training College, students, teacher training, teachers. Bookmark the permalink.